(Nanowerk News) The unassuming piece of stainless steel mesh in a lab at The Ohio State University doesn't look like a very big deal, but it could make a big difference for future environmental cleanups. The mesh coating is among a suite of nature-inspired nanotechnologies under development at Ohio State and described in two papers in the journal Nature Scientific Reports ("Mechanically durable, superoleophobic coatings prepared by layer-by-layer technique for anti-smudge and oil-water separation" and "Nanomechanical behavior of MoS2 and WS2 multi-walled nanotubes and Carbon nanohorns"). Potential applications range from cleaning oil spills to tracking oil deposits underground. The work was partly inspired by lotus leaves, whose bumpy surfaces naturally repel water but not oil. 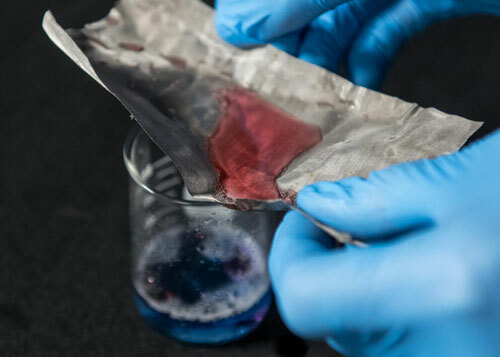 To create a coating that did the opposite, Bhushan and postdoctoral researcher Philip Brown chose to cover a bumpy surface with a polymer embedded with molecules of surfactant--the stuff that gives cleaning power to soap and detergent.